Specifically let's look at #2. There is truth in both sides. In some cases that truth is a nugget, in others that truth is rather large. In either case, there is still truth on both sides. An effective, accurate perception of any given situation would be one that takes into account both sides of truth. Without that, the perception will be skewed. So, ask yourself, are you an honest person? Honest with yourself? On the one side you know you are doing the absolute best that you can. Are you honest enough with yourself that you also know that you need to do better? Are you certain you are justified and at the same time do you accept that there are consequences for every action of yours? Positive consequences and negative consequences? Effective ones and ineffective ones? I bring to light this honesty with yourself because all too often, when we are off baseline, that is when our honesty with ourselves tends to wane. What can be difficult to remember is that when you are off baseline that is your cue to recall that you are responsible for checking in with yourself. Find out what is working and what isn't. Go through a check-list of sorts, ask yourself, Am I capable of making a wise-mind choice? Are the words that are coming out of my mouth helping or hindering? Am I using skills? And be honest with yourself. If you are so far off of baseline that your choices and actions are not coming from wise-mind, then it is your responsibility to back up and re-group. Remember, you are responsible for how you impact those around you. Yes, your support group is going to be understanding, and hopefully those that love you will give you the amount of empathy you need, and you are responsible for any pain that you may or may not cause those around when your actions are coming from a place off of baseline and are no where near wise-mind. That is a truth. Here is a perfect example of where 2 truth's co-exist. You are right, things are painful and upside down for you and you are responsible for hurting others when you behave outside of wise-mind. Well, since no one is perfect there will always be times that everyone of us say or do something that hurts those that we love. First, ask yourself, would it help or hinder to tell that loved one that you are not responsible for their pain and if they just were to not let it hurt them then they would be OK? Obviously there is truth there too, a nugget at least. Yes, as individuals, we are responsible for giving someone too much power and having our emotions run directly off of everything they say and do. That is not the kind of pain I am referring to here. Obviously, there are extremes in any situation. Here is the question though, are you able to be honest enough with yourself that you have seen your error, and are able to apologize to anyone you may have impacted by behaving off-baseline and outside of wise-mind? Or are you the type that cannot bring yourself to apologize? Honesty with yourself requires that you act on what you are aware of. Perhaps you are the type that can see where perhaps you have hurt someone around you but you cannot bring yourself to say something? That wouldn't be being honest. There is no shame in analyzing your situation and understanding that you are off of base-line and are making choices outside of wise-mind, maybe your actions are emotional and chaotic? Perhaps you are overly logical and cold? To think that those ways of handling yourself do not ineffectively impact your support system or loved ones is not being honest with yourself. If you want to continue to grow and flourish, try seriously looking at how honest you are with yourself. In all reality, being dishonest with oneself if easier than being dishonest with another person. Being dishonest with another person you have someone to call you on it. Whereas being dishonest with yourself, who is there to call you out on your dishonesty? Throughout the whole of the coming week, simply observe. Observe how you interact with those around you. How would you describe those interactions? Of those actions, how often were you off baseline? Were you able to see any particular time that you were making choices from emotion mind or logic mind without the assistance of wise mind? Grab a journal or something to jot down your observations. If you are seeing a therapist, talk to him/her about your observations. If you are not in a group or seeing anyone, post a comment here about your observations. 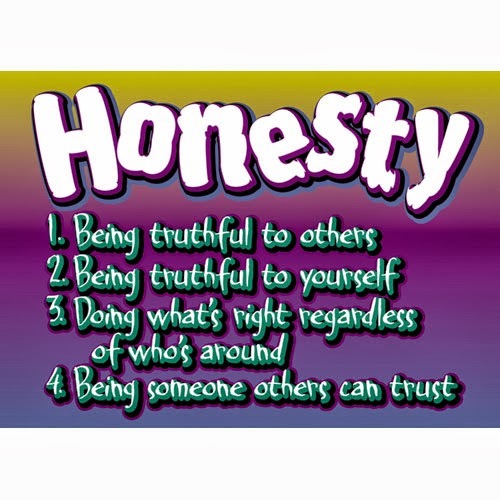 Honesty is a multi-faceted skill and can be very healing in your efforts to better control your mental illness. Who knows you also may learn a great deal about yourself with these observations!